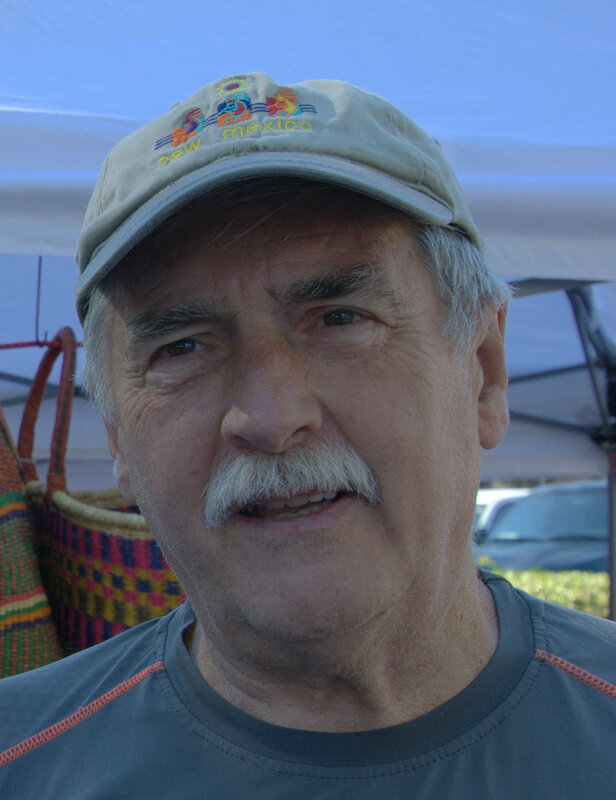 Frank Ploof’s last job before retirement was at the Lawrence Livermore National Lab. He was a Computer Scientist by classification but spent most of his career defining and building information systems. Working with scientists got him accustomed to information systems, critical thinking, testing theories, and working with data. For well over the last five years, Ploof has been a key member of Modesto’s Homeless Documentary project. He’s also been a volunteer homeless outreach worker with an unsurpassed understanding of the services available for people in need. Prior to that he was on Modesto’s Blue Ribbon Commission for the Homeless. After the Ninth Circuit ruling that criminalizing people who slept in public spaces when there was nowhere else to go was “cruel and unusual punishment,” Modesto authorities responded by allowing camping in Beard Brook Park. 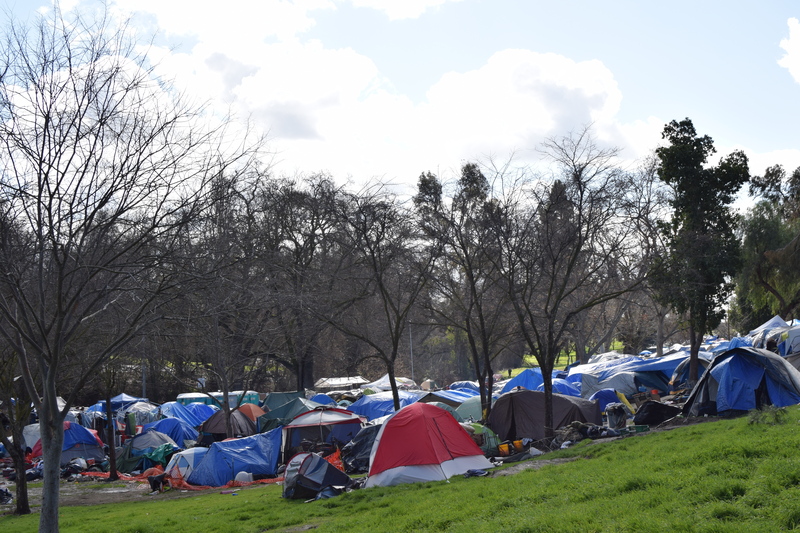 Located near industrial buildings along Modesto’s south Morton Ave., Beard Brook Park had been frequented by homeless people for well over ten years. 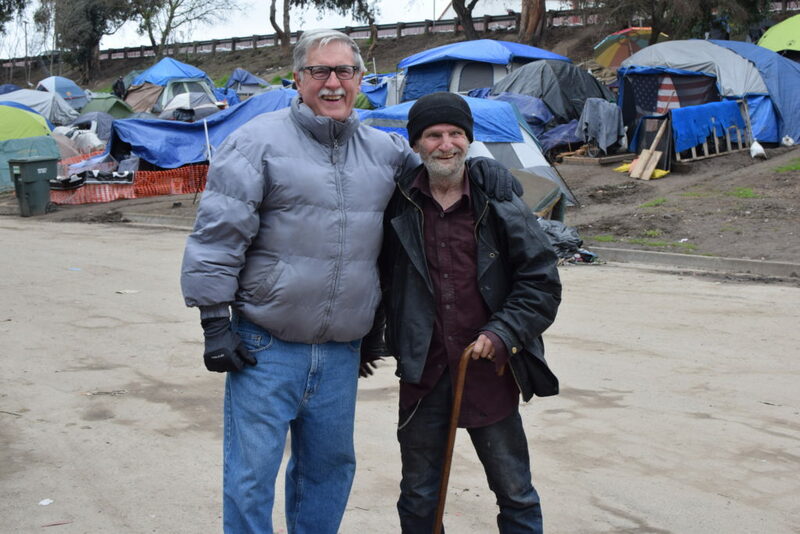 Early on, in part because he was so familiar with homeless people and services, city leaders asked Ploof to help coordinate the activities of people in the park with the City service providers. Beard Brook Park soon became known as “Beard Brook Village.” It was conceived as a “low barrier shelter,” which meant there would be few restrictions and police patrols would be the same as in any neighborhood. Ploof said that participation by the community at large was a key to its operation. The City provided water, porta potties, and trash pickup and the community provided nearly everything else. Volunteers, “really stepped up,” but over time even donations became a problem as the village population grew. Another major issue arose as the weather turned colder. Since there was no electricity in the park, the only source of heat was either from gas or wood. Gas was expensive and wood virtually free, so many were using wood for cooking and heat. Unfortunately, because wood smoke was causing air pollution issues, all wood fires were banned, which left folks with no way to heat or cook unless they could afford gas. “Park justice” is the time-honored way homeless people police themselves. Anytime a member of the group violates the unwritten codes of conduct among homeless people—stealing from the group, bullying, etc.—he or she is pushed out of the group. Usually the pushing only involves a group of three or four people telling the unwanted person to get out. In the most extreme cases, law enforcement is alerted. “After a while,” said Ploof, “we began running out of room.” For the most part, problems in the growing village involved ongoing cursing between squabbling couples, shouted threats, loose dogs, overflowing trash receptacles and filthy porta-potties. Overall, police calls involving homeless people dropped dramatically around the city, and when the cops did step in at the village, people complied with their commands. Ploof said that in addition to the declining crime statistics around the city, Beard Brook Village made it easier to locate and help people in need. 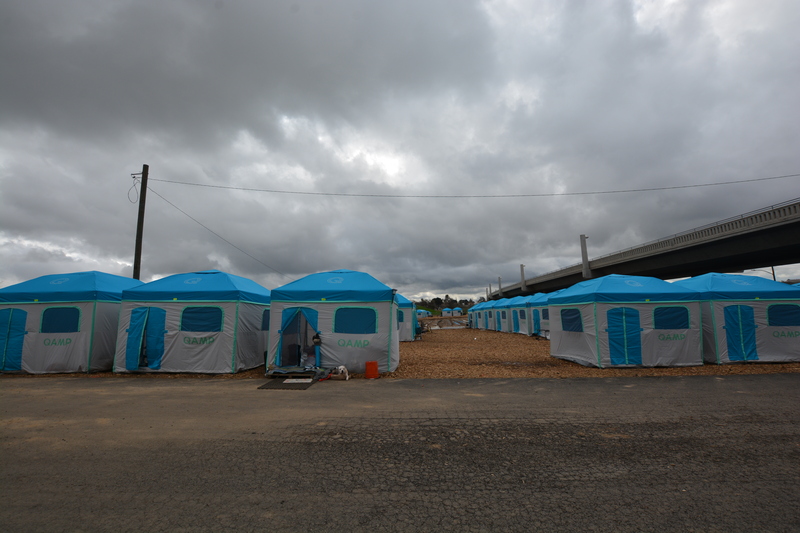 “Many people were relocated to housing and some even found work,” said Ploof. One couple became managers of a trailer park, based on their past work experience. 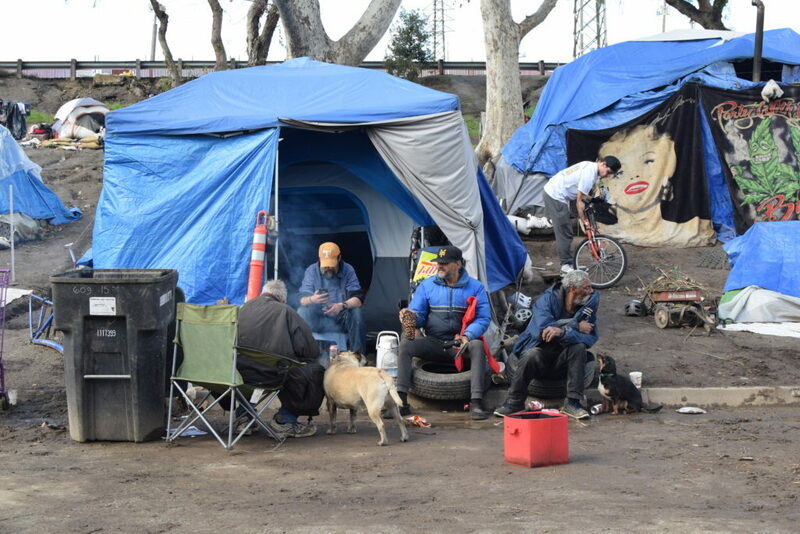 As homeless encampments have become more common, especially in cities where rents have soared past incomes, authorities are increasingly faced with the dilemma of permitting camping or moving people on. The Ninth Circuit Ruling has driven local leaders to permit camping in designated areas, but most authorities are looking forward to expanding capacity at shelters. In almost all cases, civic leaders hold expectations that people will at some point become mainstreamed and independent. Frank Ploof believes that will happen in only a few cases. The lack of service capacity and an even more critical lack of shelter are major reasons people like Frank Ploof favor a “housing first” approach to homelessness. Unfortunately, California has a severe housing shortage—especially affordable housing—which is perhaps the major reason for such widespread homelessness. Many homeless people receive disability and social security incomes, but the amounts aren’t enough in our rapidly escalating housing market. Even the cheapest motels can charge $60 per night, though the recently condemned Budgetel on Modesto’s McHenry Avenue was reportedly offering “bargain” rates at $350 a week. At these prices, it takes more than an entry-level job to afford housing, and homeless people rarely even have a place to hang their clothes or do their laundry, let alone look presentable on a daily basis. Until affordable housing becomes more available, Ploof favors encampments, though he adds they need to be managed. Ploof said his motivation for working with homeless people at Beard Brook Village was to provide help, but he wasn’t able to as much as he wished as operating the village took precedent. 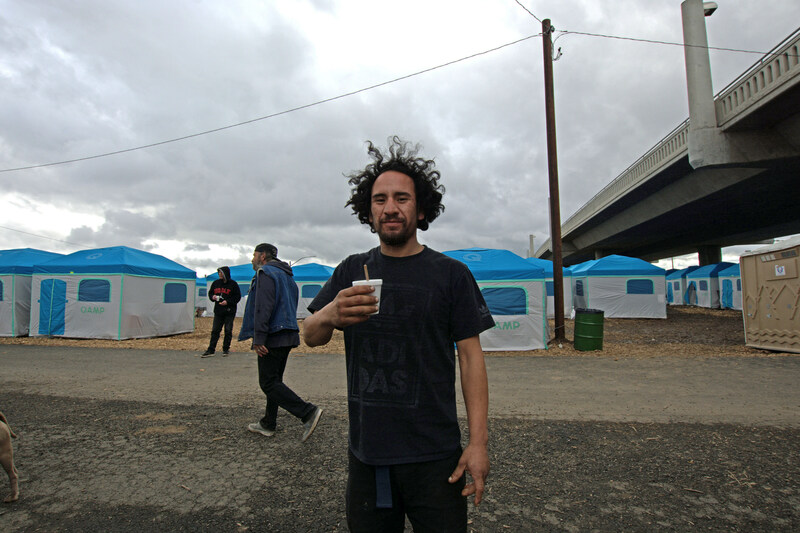 Though Ploof doesn’t particularly like bureaucratic structure, he says the transition to the Modesto Outdoor Emergency Shelter (MOES) has been successful and represents an improvement for most people. 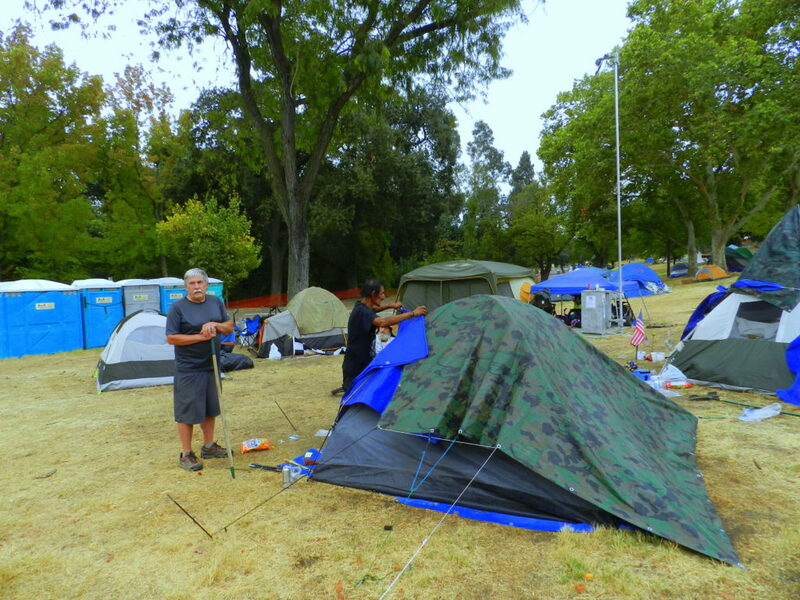 “They have bigger tents and more room,” he said, “and there’s a security presence at night.” Most people in the new camp appreciate the presence of social workers and even law enforcement, especially since Modesto Police Officers have been able to establish trust among the campers. Still, Frank Ploof can’t help thinking of what it will take to really help homeless people. Ploof thinks Beard Brook Village was not just beneficial to the campers. “We learned a lot from Beard Brook we can apply to MOES,” he said. Many of the lessons involved anticipating problems no one could see at first. It was that 20% who left a huge mess at Beard Brook Park, and Frank Ploof doesn’t want to see the same mess at the new camp because he believes tents are our best current solution for homelessness, at least until we can provide better alternatives. Given the positive reaction of homeless people to MOES, Frank Ploof may be underestimating how much he’s been able to help. Thanks to Frank Ploof and people like him, more and more homeless people are getting on their feet, even if only to get off the ground. It might seem a small thing, but it’s progress—real progress. Thanks so much, Eric, for this very informative story! Wonderful to see this much progress in our county. This is a wonderful article. Frank is a community treasure. Frank was more help to the folks living in Beard Brook Village than he realizes. He offered moral support and always listened to people’s stories and problems. The people living in the Village became his friends and he really cares about them. His vast knowledge of the services available to low income and homeless people has been extremely helpful in assisting people in navigating through the system. Really slow going, there is an immediate need for micro and tiny housing set up in enclave settings. There’s a huge management challenge to making it happen in a good way. NGOs would be key for that and churches should definitely get a piece of the action if they want it. City and County need to move on it and use methods that would maximize scarce resources. Frank has a passion for getting things done hands on. Excellent narrative of Frank’s and Beard Brook Village’s history! This whole process has helped so many people, but is also a case study that is being examined by other cities struggling with their homeless. thanks, Eric, for your detailed informative article on the Beard Brook Park encampment and on the initial progress with the MOES development. And thanks, especially, for highlighting the generous work of Frank Plook. His caring commitment and persevering attention to the needs of people who don’t have homes are a model for all of us.